Macy’s is adding lockers for picking up online orders in certain stores. Macy’s is taking a page out of Amazon’s playbook as it works to boost online sales. In a photo posted on Twitter by Fortune’s Phil Wahba, the lockers at a New Jersey location look extremely similar to AmazonLockers. Macy’s currently has a deal for customers who buy online and pick up their purchases in the store, offering up to 20% off customers’ next purchase. “In 2017, we put a strong focus on improving customer experience through new service and delivery models, an expansion of Buy Online Pickup in Store, enhancements to our mobile experience and the use of AI to improve customer service,” Macy’s CEO Jeffrey Gennette said in a call with investors in late February. Customers can pick up orders at Amazon Lockers instead of having them delivered to their homes, preventing package theft and inconvenience. With Amazon’s acquisition of Whole Foods, the company gained hundreds of convenient locations to install lockers. 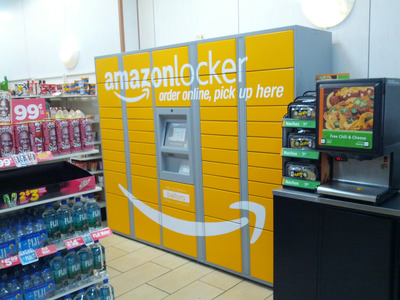 Now, traditional brick-and-mortar retailers are experimenting with lockers of their own for online orders. Walmart and Nordstrom have both added pickup stations – shelves and “towers,” respectively – to certain locations over the last year.